To paraphrase Charles Dickens’ “food glorious food,” after a few days of rain I was thinking, “sun glorious sun!” Tuesday morning on the International Wine Tourism Conference Blogger-Media Fam Trip began with a few clouds and by afternoon, while visiting wineries on the Strada del Vino e Sapori Pordenonesi, the sun was shining brightly. We had stayed for the evening at L’Uva e Le Stelle, not only a bed and breakfast but also Comelli Paolino, a winery. 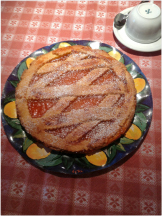 We enjoyed a delicious breakfast at which we were offered cheese, sausage, home baked Italian pastries that included a wonderfully light tart made by the owner’s grandmother. We need the recipe! During breakfast Terry asked about the winery, visited the cellar and tasted several wines. Too soon it was time to leave for our group’s first winery visit of the day, Pitars wine cellars. Soon after entering the Pitars facility, we noted a dried five-foot stump that had been dug up. Quickly we learned that this was from a mulberry tree. Live mulberry trees in the area were pointed out. Mulberry trees are protected in this region. Many years ago when Italy had silk industry mulberry leaves were used for silkworms. We also noted that in this modern-style winery there were numerous works of sculptured wood. An artist has created many of these fine pieces. Soon an event for the artist will take place featuring his wood carved designs. After observing the vineyards from the first floor, we were led upstairs to the third floor that reminded one of a large, well-furnished attic. Large windows on four sides opened and provided views of the vineyards. We tasted several wines including a Prosecco, Tureis IGT 2010, and Naos IGT 2007. Tureis was a blend of Friulano, Chardonnay and Sauvignon Tureis is the name of a star. Naos was a blend of Refosco dal Peduncolo Rosso, Merlot and Cabernet Franc. 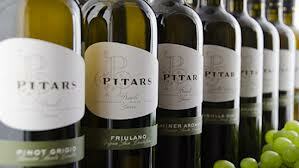 Our time at Pitars passed quickly and soon we were on our way to our second winery of the day. Our next winery to visit, Tenuta Fernanda Cappello, was created by architect Fernanda Cappello. Inside the facility is light and airy. We were treated to a tour of the vineyards where the grapevines were still sleeping awaiting the coming of spring. The vineyards have the lower Alps to the north and the Adriatic Sea is to the south. We were also given a tour of the winery. Later we trudged up to the second floor to enjoy a tasting of wines and local foods. The wines we tasted included Friulano, Sauvignon Blanc, Aromatic Traminer, and a Cabernet Franc. Eventually we reached Spilimbergo, a unique town with a very historic church that dates back to the 1100s. Colorful but faded frescos from centuries past add to the sense of “old.” To the side of the altar one wall has frescoes representing stories from the Bible. The church is still in use by residents. A nearby castle was built in the 1500s and is still structurally sound and in use. Our visit to Spilimbergo was way too short but we were behind schedule and needed to travel to the next impressive winery. During our journey to wineries we saw many signs of the Easter season inside wineries. 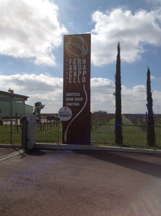 Perhaps the largest display was at Tenuta Fernanda Cappello. The Friuli region of Italy offers a delightful experience. The area is not crowded in March and there are many cultural experiences including food and wine. Italians are very friendly and welcoming to visitors. Pingback: Il Friuli ha conquistato il cuore dei blogger | Wine and Food Routes in Friuli Venezia Giulia: more than wine tourism!